What is the limit for? Stepper motors come in all shapes and sizes, each with a different voltage and current rating. AstroEQ is powered from a 12V supply, so what happens if you have a 6V rated motor like the skywatcher dual axis kit motors? Well, the driver chips used in AstroEQ have the ability to limit the current supplied to each coil to a set level, even if the voltage is much higher than the motors rating. In the end it doesn't matter how much voltage you apply as long as the current (and hence power dissipation) is kept in check - in fact applying a higher voltage will allow the motors to generate more Torque at higher speeds. So, you have plugged in your motors and noticed they are getting quite hot? Well, you need to reduce the current. Conversely, if your motors can barely move and are not hot, you may need to increase the current limit. It is possible to set the limit to a specific value, however unless you know the rating of the motors which can be difficult to find, the process ends up being trial and error. The two methods of setting the current limit are outlined below. 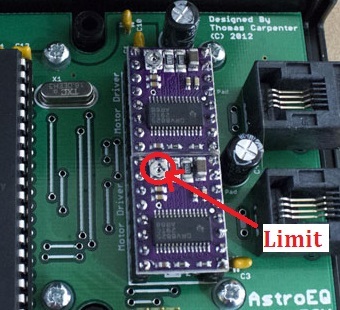 The current limit is set via two potentiometers inside the AstroEQ enclosure. These can be adjusted with a cross cut screwdriver. On the back of the enclosure you will find two black screws which need to be undone to open the case. Once the case is open, inside you will see two purple circuit boards next to the motor connectors. One each of these there is a small cross cut screw head as indicated in the picture below. The first method of adjusting the current limit is a simple approach of trial and error. This does not require anything more than a small screwdriver. Turning the current limit potentiometer adjusts the amount of current the motors receive. You can make the adjustment with AstroEQ powered up and connected to EQMOD, that way you can feel how hot the motors are and adjust the limit accordingly. Turning Anti-Clockwise reduces the current the motors receive. Turning Clockwise increases the current the motors receive. You will only have to turn the pot by a few of degrees each time (say ~5 degrees to start off with). The second method allows accurately setting the current limit to a specific value. For this method a Voltage measuring device is required - a Digital Multimeter is ideal for this task, but anything that can measure voltage to at least 0.1V resolution will work fine. There is a small via hole on each of the driver boards located between the driver chip and the potentiometer. The location is marked in red on the below image. The voltage measured between this test point and ground is the reference voltage used by the drivers to set the current. So for example, setting the reference voltage to 0.5V will result in a current limit of 1A. In this way you can be sure you have set the correct voltage for your motors without trial and error.